U.S. Immigration and Custom Enforcement agents first spotted a large motor home headed westbound on Highway 46. The agents followed the motor home as it turned northbound on Highway 1, where it was joined by two cargo vans and a sedan. The suspects then parked on the side of the road north of San Simeon and began loading the vehicles with large bales of marijuana. San Luis Obispo County Sheriff deputies assisted in a pursuit on Highway 1. One of the southbound vans went over a cliff. 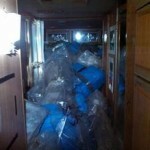 Officers discovered a large quantity of wrapped marijuana in the motor home and methamphetamine in the sedan. The investigation is ongoing. So, was the boat coming from one of the advertisers in the back of the Santa Maria Sun or New Times SLO, or was it making a delivery to Compassionate Care? How many patients *medicine*, cough, cough, was interrupted in it’s delivery? How many patients died because they didn’t get their *medicine*? Another ignorant poster. Dispensaries only sell locally grown medicine. All that crap they confiscated was bound for the east coast and Midwest. I thought Burt Reynolds and Sally Fields out ran Jackie Gleason and Jerry Reed got away with the illegal cargo? Have these ICE agents been escorted to outside the California border? Doesn’t the CHP run the risk of breaking the law by assisting ICE? Gov. Brown? Helloooooo…..? Is this thing on? Medicinal needs will prevale and I have it from a very reliable source that they are Colorado illegals, where weed is legal. What KIND of “reliable source”? After further questioning, it was determined they were all working for Cory Pierce…. So true. I still laugh about that fool. May he rot in hell. Of the sixteen arrested, fifteen claimed to be law students, nine were here to take their driver’s license test, one said he was waiting to be called to jury duty (he didn’t know Brown vetoed that bill) and ALL of them expected to be shielded from the Feds. …and they were all willing to vote democrat – even though the party platform is generally the polar opposite of their heritage. Did they have the new illegal drivers licences? If they do, it will make it easier for authorities to identify and prosecute them. There could be a glitch with that plan…. like they do with green cards and SS cards. license with the Panga Boat as their address.. .
Not sure, but I’m sure they had insurance, right? There’s a good chance they did have insurance. Do you have any information that suggests otherwise? I guess you think they likely had permission from the Coast Guard to land their panga boat here, too. No I don’t think that. The Coast Guard doesn’t make those kind of authorizations. However, plenty of companies do sell insurance to people, including non-citizens. Happens all the time. Big difference between insurance companies and the Coast Guard. As far as I’m concerned, it makes sense for a multi-million dollar crime ring to spend a little bit to make sure their drivers don’t get busted for not having insurance. Doncha think?